Athlete adaptation requires a stress load to the system that is slightly injuries to local tissues and joints. In order to keep up with the demands of training we need to recover effectively and efficiently. Don't let stiffness and pain inhibit you from reaching your goals this training cycle. Whether you are looking to recover from a difficult training day or need some increased non-threatening sensation to calm down the nervous system sports massage is great for any pain complaint. With the use of IASTM, cupping, and active release we can help reduce muscular and joint tension to get you back to your daily routine. If you've just finished a hard training day or preparing for a next day, or intraday competition recovering quickly is essential. This can be done passively by our state of the art compression garments designed to push venous and lymphatic fluid away from the sore limb back to the heart for recycling. Drift off and take a nap while the pumps take care of the work for you. Recovery is all about managing blood flow. 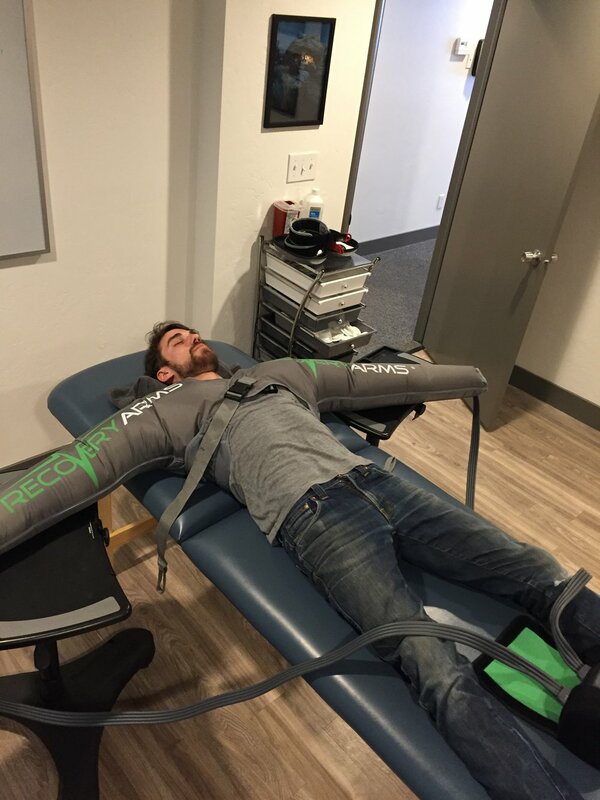 When lightly load the tissues with blood flow restriction we cause local capillary bed congestion and swelling. In addition we increase the heart rate to meet the demands of the working tissue. That means once we take the pressure off the limb the elevated heart rate will push fluid more quickly away from the working limb.